Valid only for Sunday Brunch only. See the menu. Promotional value expires 90 days after purchase. Amount paid never expires. May be repurchased every 90 days. Reservation required. Limit 2 per person, may buy 2 additional as gifts. Limit 1 per table. Valid only for option purchased. Full brunch can be substituted for salad bar, not to be combined with any daily specials or promotions. Not valid on statutory holidays or special events; not valid on Valentine’s Day, Mother’s Day, Father’s Day, and New Year’s Eve. Merchant is solely responsible to purchasers for the care and quality of the advertised goods and services. 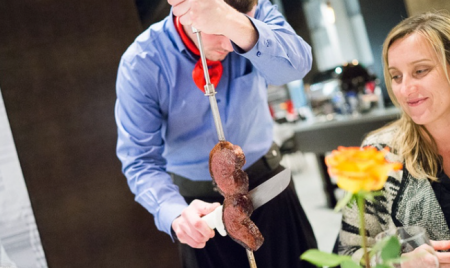 Co-owner and chef Joao Dachery was born and raised in the Pampas, the Prairie region of Brazil where Brazilian barbecue was born. Surprisingly, however, he began his career as a business owner. Fortunately, he discovered his passion for his native land’s succulent cuisine, attended culinary school, and joined Oscar Lopez to open Pampa. The rest is history. Pampa’s dinner menu features a whopping six different kinds of beef, all coming from different parts of the steer with varying levels of tenderness, flavor, and texture. Among them, there’s the ultra tender filet mignon, which cooks wrap with juicy pieces of sizzling bacon, as well as the much leaner and chewier bottom sirloin. And that’s just the beef—there’s also two different pork options, two chicken options, and a marinated leg of lamb. The tannins of Chile’s Concha Y Toro Don Melchor cabernet sauvignon perfectly compliment slices of the marinated lamb legs. Dr. Pauly Bergweiler riesling’s acidity helps balance the richness of Pampa’s flavorful pork sausage. Osoyoos Larose Le Grand Vin, a robust, Bordeaux-inspired blend from the Okanagan Valley, goes exceptionally well with the AAA top sirloin.